[ Lord Charles Clinton, Conservative politician. ] Autograph Letter Signed ('Clinton') to the Provost of Eton, regarding the hanging of his portrait on 'the pannels [sic] of the College Hall'. Farnham Castle. 18 December 1857. 2pp., 12mo. He 'unfeignedly' feels his 'unworthiness to be placed among those sons of Eton whose portraits are intended to grace the pannels [sic] of the College Hall'. He will comply with the Provost's wish, 'as soon as opportunity permits, & after I have learnt from you the most suitable mode of carrying your design into execution'. All items in good condition, with minor signs of age. The drafts are both printed on yellow paper. Each is 4pp., 4to. The two appear the same textually, but one has two slips of paper with amended text attached, and the autograph emendations to the two are different from one another. Also present is a leaf from 'Lifewise' magazine, November 1993, with one page carrying Pitt's memoir, accompanied by a photograph of Wodehouse being interviewed at Tost by Angus Thuermer. The piece begins: 'I first saw P. G.
Autograph Letter Signed ('Newcastle') from Henry Pelham Fiennes Pelham-Clinton (1811-1864), 5th Duke of Newcastle-under-Lyne, declinging an invitation, and complaining of the effect of his public duties on his private affairs. Clumber Park, Nottinghamshire. 14 April 1855. 4pp., 12mo. 26 lines. Bifolium. Good, on lightly-aged paper. Addressing an unnamed male correspondent, he begins by declining his correspondent's 'kind invitation' to his visit his house, 'on the ground that has already compelled me to refuse similar hospitality on that occasion from Mr. Wright and others'. 17 Portman Square, London. 18 February 1852. 3pp., 12mo. 20 lines. Bifolium. Good, on lightly-aged paper. Having been elevated to the Dukedom in the previous January, he writes to infom Newham that he was not aware that his father the 4th Duke 'was a Patron and Proprietor of the Nottingham Subscription Library. The share in the Library, being part of the personal Estate in Notts: does belong to me, and I shall be very glad to continue on the list of your Proprietors'. He will give directions for the annual subscription to continue to be paid. 4 Autograph Letters Signed from John Stuart Bligh, 6th Earl of Darnley, and 8 Autograph Letters Signed, Autograph Card Signed, and 5 invitations from his wife Harriet Mary, Countess of Darnley, all to Rev. Charles William Shepherd of Trotterscliffe. 1853, 1855, 1889; from various addresses including the House of Lords and Cobham Hall, Gravesend, Kent. 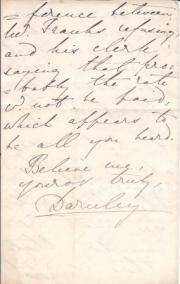 The Earl of Darnley's four letters (all signed 'Darnley') total 27 pp in 12mo; Lady Darnley's eight letters (all signed 'H. Darnley') total 26 pp in 12mo. All items in good condition, on lightly-aged paper. Darnley's first letter, 16 September 1853 (12mo, 12 pp), is unusually blunt for the period, and revealing on the etiquette of the period. It begins: 'I trust that the change in your mode of addressing me was accidental, and I have therefore not imitated it, and have used one word which you omitted [presumably 'Dear']. Seven Autograph Letters Signed, five signed "William Boone" and two signed "Thomas Boone", all to the Duke of Newcastle, with additional lists. 29 New Bond Street, [London], 1859 (William) and 1862 (Thomas). Total 18pp., 8vo (letters), 3pp., 4to (lists), and one page 8vo (list). 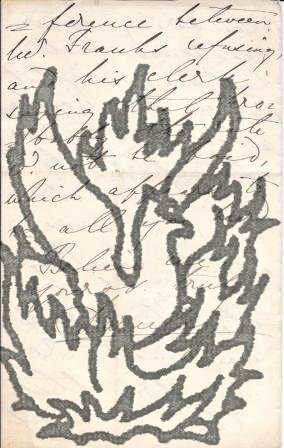 The dealers are giving advice and information to the collector, particularly relating to the Dawson Turner Sale (1859) and the Libri Sale (1859), often illegibly or nearly so. A. William Boone (4 June 1859) advises that a "holograph letter of Napoleon" will attract interest enough to justify two guineas and would sell for more in Paris". He believes a volume "on Scottish affairs" would "realize fully" £420.